The sim Scribbled Hearts, which closed late last year, has returned, built anew, and is now open to visitors. Home to Snowy Melody-Deluxe's *. emm [shop] and Noel Ryhann Kennedy-Deluxe's Little Closet Mainstore, the sim was largely designed (in keeping with past versions) by Randi Lenroy. It's a beautiful, tranquil place, with frequent visitors who take advantage of the region's inviting character. A group of low-lying islands surrounded by a calm sea that reflects the trees and buildings, Scribbled Hearts affords panoramic vistas. 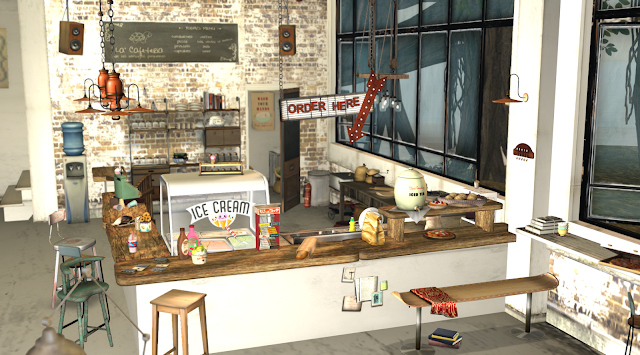 The sim, which is rez-friendly (for two minutes at least) features several walking paths and places to visit, including a beach and a café (photo above). In the past, the landscaping has radically changed with the seasons, so I hope we'll see a fall iteration of Scribbled Hearts as cool weather begins to arrive.